After setting up a Raspberry Pi B+ with Kodi to stream video content to my TV. I began to have some problems with the range of the small nano USB adapter I was using. The small nano USB dongle works fine as long as it was close to the router but began to have problems when any distance was introduced. So I began to search the forums to see what would be a good long-range USB adapter that would work with my Raspberry. For those don’t know it is the chipset of the adapter that makes it compatible with the Raspberry. Here are the most popular chipsets. After a known good chipset is used another thing that a Raspberry Pi can have problems with is powering a USB adapter/dongle. The Raspberry doesn’t put out a lot of voltage to power a USB device for this reason nano, or very small USB adapters, are the most commonly used to enable Wi-Fi on a Raspberry. After reading through the forums I could see that there is some debate on whether a long-range USB adapter would need a USB hub to supply the power requirements it needed to run. I settled on the Alfa AWUS036NH USB adapter which uses the Ralink 3070 chipset. This is a known adapter that is very popular with Linux especially penetration testing versions such as Backtrack and Kali Linux. 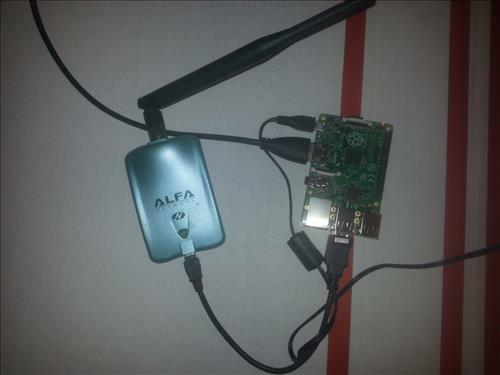 The Alfa AWUS036NH works very well with the Raspberry Pi and does not require a USB hub to power it. I made a video using it while running Kodi with the Project Free TV add-on to show that it streams very well. For me it was basically plug-and-play. If you need a long-range adapter that will work with the Raspberry Pi than the Alfa AWUS036NH is a good adapter to use. Here I am testing the Alfa AWUS036NH long range USB adapter / Dongle with a Raspberry Pi B+ model. I am testing it using Kodi /XBMC with Project Free TV to test its compatibility. I have the exact same model as you and it seemed to work fine for about three months, but I’ve recently found that it drops out with high usage. Even downclocking the CPU and turning off power saving features for the WiFi adapter hasn’t solved the issue. Have you seen anything similar with high traffic situations? Alfa AWUS036NH support hostapd ? I work on similar solutions: IoT Long Range and IoT Swarm Networking with Raspberry Pi. Raspberry Pi with 4 Long Range modules for Sub-GHz license free ISM. It will work as Diversity receiver, Repeater, Gateway and Hub. And via GPS, BLE, WiFi on Raspberry Pi – it will cover miles of distance, the city with your own wireless IoT Sensor Network: it will bridge your BLE or WiFi via Long Range wireless links.